Any respect we ever had for The Daily Telegraph long drained away, to be replaced by a slow-burning contempt for the editors and proprietors who let a once-proud title degenerate in the way it has. A milestone in its descent to the bottom, however, must be its latest editorial on the asylum crisis, with the accompanying authored piece by Nigel Farage which jointly and severally demonstrate the profound ignorance of the newspaper team and the Ukip leader on this issue. 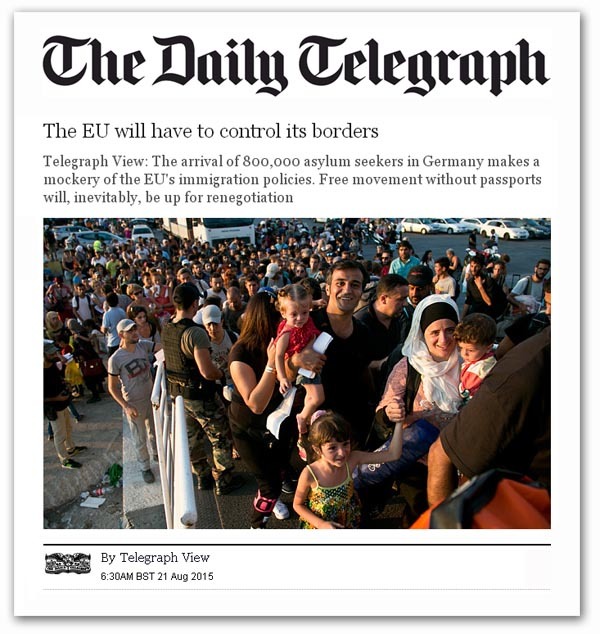 Addressing first the Telegraph piece, we have the editorial note that Germany is now expected to receive 800,000 asylum seekers in 2015, describing this as part of “Europe’s migrant crisis” which, it says, “has reached astonishing proportions”. Although not technically wrong, it is not helpful to call this a migrant crisis. We are dealing here with asylum seekers, many of whom after processing will be declared refugees. Some others will be afforded leave to remain on human rights grounds, while the others will be considered economic migrants. Some of those will be deported. Others will disappear into the population and become illegal immigrants. Effectively, therefore, there is a refugee crisis. And within that is an exacerbating factor of economic migrants piggy-backing on the refugee flow, making two separate but linked problems. But neither of them are migrant crises as such. To define them in this way is completely to misrepresent the problems – and therefore obscure the solutions. This, though, is the least of it, as far as the Telegraph goes, for it then goes on to assert that the arrival of these people is precipitating in Germany a greater awareness “of the desperate flaws in the way that the EU handles its utopian promise of the free movement of people”. Such an assertion is bizarre – bizarrely wrong. The flow of asylum seekers to Germany has nothing whatsoever to do with the EU’s treaty provision of free movement of people, which applies only to citizens of the EU Member States (and EEA states), and then within the external borders. What we are dealing with here is something completely different – in law and fact – the effect of the 1951 Geneva Convention on Refugees, and the 1967 Protocol, together with the adoption of its provisions in the EU’s Charter of Fundamental Rights, which also makes asylum seeking a human right. No sensible or knowledgeable writer could possibly consider an information piece without mentioning this. But then this is the Telegraph, whose task in life seems to be to misinform its readers and parade its own ignorance. Free movement, it asserts, “seemed attractive and logical during the Cold War, when western Europe was more isolated from the world’s poor by the Iron Curtain”. It then tells us: “But in the 21st century, poverty and war have driven millions to seek a new life within an expanded EU”. The irrelevance of this is obvious – “free movement” isn’t the problem. Except the Telegraph says it is. Then building on its error, it declares: “The problem has been exacerbated by two policies. One is the Dublin Convention which states that the responsibility for asylum seekers lies with the country in which they first arrive”. As a small aside, the Dublin Convention ceased to be in 2003 – to be replaced by the Dublin Regulations. But the problem, the newspaper argues, is that in recent years those countries have been Italy, Hungary and Greece – and they have simply been overwhelmed. But this is an over-simplification to the point of distortion. One of the first receiving countries was Spain, which has evaded its international obligations by building fences and virtual barriers, then to divert the flow elsewhere. As Greece, then Bulgaria and now Hungary follow suit, EU asylum policy has become a grotesque game of “pass the parcel”, with Italy, Malta and Greece ending up having to deal with the bulk of asylum seekers. What then happens is that these countries are failing to fulfil their EU responsibilities. Instead of registering and processing the incomers – and deporting those who do not qualify as refugees – they are allowing them to pass on to other member states – and especially Germany and Sweden, where they are applying for asylum de novo. The Telegraph claims that, in so doing, the receiving countries are exploiting “the second flaw in the EU’s approach: the Schengen Agreement, which commits its signatories to passport-free movement across borders”. Italy, Hungary and Greece, we are told, have been permitting, or even quietly inviting, their asylum seekers to relocate to other countries. Enormous numbers have gone to Germany. The Germans have embraced refugees as atonement for the sins of the Second World War. But 800,000 is a figure to trouble even the most bleeding-heart liberal. Once again, this is completely to misunderstand the nature of the problem for, even before Schengen, border controls had been removed. Were they to be reinstated, all that would happen is that – as we’ve already pointed out, those seeking recognition of their refugee status would simply apply for asylum at the border posts. Schengen is a complete red herring. Needless to say, the Telegraph isn’t alone in getting things wrong. Politicians throughout the continent are failing to understand the effects of their own policies, but somehow one expects more from a pompous “know-it-all” newspaper which holds itself up as the authority on such matters. Its pomposity knows now bounds, where it grandly but wrongly declares that the “EU essentially exists to regulate a free market”. Is failings, it asserts, “mock the grand claims that it makes for itself – betraying a reality of incompetence and, where it leads to humanitarian crisis, such as in the Mediterranean, moral failure”. But in this case, the ignorant speaks unto the incompetent, when the paper completely misdiagnoses the problem and ends up telling us: “The EU needs to get its borders in order”. With the display of such ignorance, it is only fitting that it should then go on to give space to the malign bigotry of Mr Farage, who seems determined to drag us down to his level, and wreck any chances of winning the EU referendum, by declaring that “immigration” will be the defining issue of this EU referendum campaign. There is no excuse for this quite deliberate elision of immigration and asylum – two entirely separate issues, with their own bodies of law and policy domains. Alarmingly though. Farage is picking up on an Ipsos Mori poll which has half of the public identifying “immigration” as one of the biggest issues facing the UK. This is something which the polling company itself should not have recorded, as it too is mixing up disparate issues. Needless to say, Farage exploits the confusion, as he has always done, associating the flood of asylum seekers and would be refugees with the European Union “open border” policy. We see the chaos in Calais, where thousands of migrants are risking their lives to get from France to Britain; we see refugees in their thousands risking life and limb as they cross the Mediterranean on ships sailing from Libya. And we see that the issue of open borders and mass immigration is no longer simply an issue of social problems and the impact on British workers, it is fast becoming one of national security. To resolve this, the fool declares that the British people “want an Australian-style immigration policy that allocates work permits to those our economy needs, that says no to those whose skills we do not need, and that gives an emphatic denial of entry to those we have any suspicion want to do us harm” – as if that would have the slightest effect on the flow of asylum seekers. Matching the Telegraph for its ignorance, he then writes of witnessing “the failed policy of the EU’s open borders, supported by the establishment politicians to the detriment of our nation”. When the referendum comes, Farage concludes, the British people will finally have their chance to reject these open borders by saying “no” to the European Union. But all Farage is doing is holding us hostage to fortune. Despite his own manifest ignorance on the subject – and despite the lacklustre performance of the Telegraph, in the two years to the referendum, there is plenty of time for people to learn of the real issues behind the asylum crisis. The danger for us is that they will turn against the likes of Farage, offering false nostrums and exploiting the misery of others for his own political ends. Elsewhere we have written of the hazards of promoting misinformation, citing Gene Sharp, who tells is: “Claims and reporting should always be strictly factual. Exaggerations and unfounded claims will undermine the credibility of the resistance”. This is a lesson Farage is incapable of learning – and doubtless one of the reasons why he is such a failure as a politician. But there is no reason why we should let his ignorance drag us down. Below is the Telegraph article in full – showing just how self serving and lightweight the populism of the article is and just how misleading and lacking in solution such an approach can be when personal ambition and ego get in the way of competent journalism in what was once respected as a serious newspaper! Clearly when Britain leaves the EU rthere will be little or no change to our border controls if we hope to continue trading with EU partners and the rest of the world. We must remember that in a fragile balance we, like every other nation on this planet, enter into grown up arrangements with eachother that have little or nothing to do with the EU who merely re-write them in the jargon of the ENARCHS and pass them on to the vassal states of the EU. The laws themselves are made by world bodies like the UN, WTO, CODEX, Davos and a raft more. It is unsurprising that people have lost sight of this and rather childishly believe when we leave the EU all our ills will be solved but what is more concerning is that supposedly responsible newspapers are willing to pander to this populist and extrermely irresponsible myth! One reason the media may well be peddling this level of misunderstanding may well be in a venal self interest to apease advertisers or in the likes of the BBC to apease their benefactors in the EU who provide them with free studios and journalistic access with the jam on their bread and butter provided by multi Million Pound loans to featherbed their grossly over generous incomes and lack of real imvestigative journalism beyond the knickers, vicars and the odd bent political or police figure level! grants they receive. Another great snag is the fact that the halls of academe are seeded with many 100s of so called ‘Erasmus’ professorships and student scholarships all in real terms funded from the propaganda budget of the EU. It is from amongst these EU funded organisations that much of the spin is provided, not least by quotes supplied to businessmen by their EU employers and founded on little more than the dirst aim to keep the entire, largely failed, EU project staggering forward – Let the Greeks or for that matter the Portuguese, Irish, Italians and Spaniards, or even in rare moments of honesty, the French tell you of the success of the EU economic policy and membership of the EUro which is crippling EUrope as it slithers forward on a bed of lies, bribes and bullying! In very simple terms the EU is not even prepared to admit the fact that all are aware of Greece will NEVER be able to pay off its current debts let alone interest and essential future borrowing their GDP can not and never will sustain such debts. When you consider the levels of dishonesty that have created this misery is it any wonder that politicians working in that system will say almost anything to hang onto their grossly inflated incomes, bribes and expenses – as you will note in the Telegraph article below! Europe’s migrant crisis has reached astonishing proportions. Germany is now expected to receive 800,000 asylum seekers in 2015. This amounts to roughly 1 per cent of the country’s population, or a little more than the population of Leeds. They come from war zones beyond the continent, such as Syria; but also from the poorer parts of Europe, including Kosovo and Albania. And with their arrival, Germany becomes ever more aware of the desperate flaws in the way that the EU handles its utopian promise of the free movement of people. Free movement seemed attractive and logical during the Cold War, when western Europe was more isolated from the world’s poor by the Iron Curtain. But in the 21st century, poverty and war have driven millions to seek a new life within an expanded EU. The problem has been exacerbated by two policies. One is the Dublin Convention which states that the responsibility for asylum seekers lies with the country in which they first arrive. In recent years those countries have been Italy, Hungary and Greece – and they have simply been overwhelmed. To alleviate this problem they have exploited the second flaw in the EU’s approach: the Schengen Agreement, which commits its signatories to passport-free movement across borders. Italy, Hungary and Greece have been permitting, or even quietly inviting, their asylum seekers to relocate to other countries. Enormous numbers have gone to Germany. The Germans have embraced refugees as atonement for the sins of the Second World War. But 800,000 is a figure to trouble even the most bleeding-heart liberal. The answer is probably that free movement will remain for citizens of the EU but that there will have to be a much tighter enforcement for anyone who falls outside of that definition. This belies the EU’s self-image as a liberal, internationalist project. In reality, it is protectionist and will probably have to engage in the variety of conservative policies normally associated with Australia. There does need to be an aggressive crackdown on people smuggling. Asylum applications ought to be lodged and processed in countries outside of Europe. And those seeking asylum from within the EU will have to be swiftly deported if their claim is rejected. The EU essentially exists to regulate a free market. At Calais it has failed: the free movement of people has been stymied by the migrant crisis. In Germany, poor control of the continental border has led to a population explosion that may prove grist to the mill of extremist parties who want to destroy the EU altogether. In other words, the failings of the EU mock the grand claims that it makes for itself – betraying a reality of incompetence and, where it leads to humanitarian crisis, such as in the Mediterranean, moral failure. The EU needs to get its borders in order.